PHPMaster.com has a new tutorial posted that introduces you to a build tool that's more common in the Java world but can easily support PHP projects, Apache's Maven. Apache Maven is a build automation tool with the purpose of building, reporting, and creating documentation of projects. It builds projects using a Project Object Model (POM) and a set of plugins shared by all projects using Maven, thus providing a uniform build system. Once you familiarize yourself with how one Maven project builds, you automatically know how all Maven projects build. [...] Through this article you will gain familiarity with Maven for PHP, and how to install and use the PHP-Maven plugin from the command line and in Eclipse. The tutorial walks you first through the basic install of Maven and get you started with an example "settings.xml" file helping to set up the PHP-Maven plugin. They help you create your first project using the Archetype plugin and its related "pom.xml" file. The project already has a defined structure (similar to what you might see in a Composer-loadable PHP repo on Github) for the source of your app and the tests. They show you how to hook in PHPUnit and phpDocumentor for testing/dcumentation builds and, finally, how to integrate it all into Eclipse to allow for easier, in-IDE interactions. In a previous post Pablo Viquez talked about integrating JMeter and Zend Debugger for testing your PHP applications. In this new post he goes one more step in and talks about integrating Eclipse, JMeter and using XDebug this time for the debugging. In a previous post I wrote about doing step by step debugging using Zend Debugger and Zend Studio making the calls from JMeter, however not everyone has Zend Server or Zend Studio installed, and since XDebug is an awesome project I though that will be awesome to do the same using XDebug. [...] As explained previously, using the browser for API debugging can be pretty hard or nearly impossible unless you build some sort of UI, which normally I do not have time to do, so JMeter is perfect for the job! He includes the configuration changes that'll need to be made to Apache and how to set up and configure the new project in Eclipse. He also includes the setup of the jMeter plan (using his example) and executing it to execute the script/get the debugging information. Why can’t someone just make a good IDE for PHP? James Fuller has posted some of his thoughts about the state of IDEs for PHP (text editors too!) and some of his recent experiences trying to find one that fits his needs. I think the first "IDE" I ever used for web development would have to be Adobe Dreamweaver (nee Macromedia). Ok, so maybe it was Microsoft FrontPage, but that shouldn’t really count. [...] This post is about my experience moving away from the oft-maligned program and some lessons learned in my quest for the perfect IDE. He tried out several options including Netbeans, Eclipse (PDT), Sublime Text 2 and one he found the most appealing, PHPStorm. Looking back I realize that IDE’s have been a constant annoyance and yet have prompted so much growth and development in my skill level. [...] I also think that the problems I have ran into with IDE’s are true about software in general. We search for better solutions and always fall short. Andrew Eddie has posted a helpful tutorial for Eclipse users out there showing how to get the most our of code assist in Eclipse PDT/Zend Studio. One of the powerful features of an IDE like Eclipse is the ability for it to "read" your code and give you some assistance about your API as you type. This could include things like class property or methods names, constants, functions, argument lists, and so on. Eclipse/PDT and ZendStudio do this by parsing a PHP class directly, but they also look at your docblocks and some other special comments where the raw PHP is not enough. This article is a bag of tricks that help you get the most out of code assistance using Eclipse/PDT or Zend Studio in those awkward corners of your code that you might have through previously inaccessible. Warren Tang has put together this new post to his blog showing how you can use the SimpleTest extension for Eclipse to execute your tests without leaving the IDE. Run the test via "Run As > SimpleTest"
He also includes the option for running the test as a web page, but that requires a little bit more code. There's also a quick look at how to run a suite of tests from the IDE (as well as in the browser). for more about using SimpleTest, head over to the project's site. In a new post to his blog Sasa Stamenkovic compares two of the most popular IDEs PHP developers are using these days - Eclipse and NetBeans and how they stack up on various criteria including configuration, navigation, version control support and debugging. I was happy Eclipse fanboy for quite a long time, and I can say that I still am. I like to try out new things, but this IDE was doing perfect job and I stick to it for PHP development. But few months ago I have tried NetBeans 7.0, and boy, after few hours it felt like home. At the end of the day, with all respect to Eclipse, I decided to switch. I will try to compare this two, but before we start I must say that they are both very good at what they do, and no matter which one you choose it will do great job for sure. On the PHP on Windows section of DZone.com, Eric Hogue looks at the PHPsrc extension for Eclipse - a handy tool that lets you run some of the common PHP QA tools right from the IDE. He walks you through the install of the plugin and shows you how to set things up to point to the executables on your development environment (complete with some screenshots). There's even an example of the output for a particularly offensive (standards-wise, of course) piece of code. On the Mayflower blog today there's a new post about an extension that's been released for Eclipse environments that lets you work with the error output from your continuous integration server right in the IDE. Cinder is a plug-in for your eclipse-based IDE (eclipse, Zend Studio, etc.) to display results of your Continuous Integration environment right inside your IDE. [...] You open the XML file containing the errors and warnings of your build (for us that's typically the PHP_CodeBrowser XML generated by a Hudson build) and get an overview of reports. Now you can sort them, categorize them and work on them in any order. Cinder can grab these files periodically if you make them available via http or on a filesystem. They've included two screenshots with the list of errors and the panel showing the specific problem directly in the code. 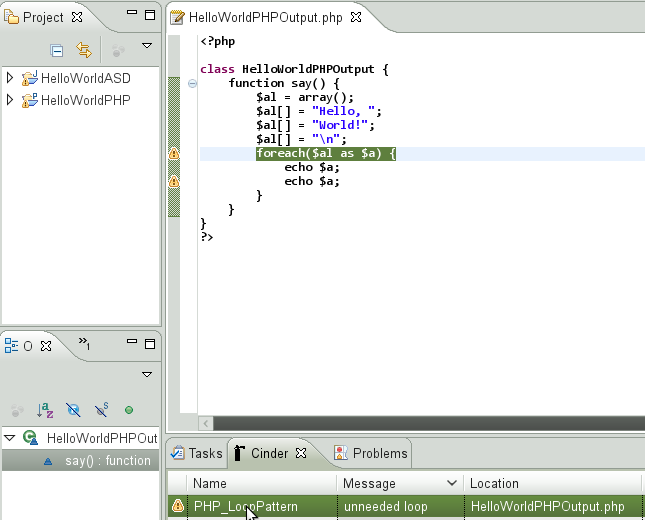 Brian Swan has a new post today looking at how to use the Eclipse tools for Windows Azure with your PHP applications. The tools allow you to more directly interface with your Azure instance without having to do much outside of Eclipse. Following on the heels of announcements a couple of weeks ago, the Interoperability Team at Microsoft is announcing the availability of another update to the Windows Azure Tools for Eclipse. In this post, I’ll use the updated Eclipse plug-i to walk you through creating and running a project in the Windows Azure Development Fabric, readying a project for deployment to Windows Azure, and deploying a project to Windows Azure. He walks you through the basics of getting the extension for Eclipse installed and how to create a fresh development project to hook into your Azure instance. Then you select the PHP runtime you want to use, set some debugging and create the project. Then running the PHP instance is as easy as selecting the "Run Windows Azure PHP Project..." from the "Windows Azure" menu. He also includes some instructions about running a custom PHP version and project deployment - all with screenshots to help along the way. From the UltraVisual blog there's a recent post showing how you can get PHP Eclipse working with FDT/Flash Builder and Ant to create some custom automated tasks. OK, so lately I have been doing a lot of work in both FDT & Flash builder and building data centric applications with PHP and mySQL back ends, it has been vital that my work flow has been up to scratch to ensure that these project's deadlines have been met and also so that I don't go crazy doing loads of crap that I don't need to do! As I have been very pleased with the ways things have run I though it best to share my set up with a wider audience. He shows you how to set up Ant support for Flash Builder and get the "PHPEclipse Stable Builds" package installed for your Eclipse instance. His example shows his process of having all of his files in one place, regardless of their type. A code snippet for the URLLoader is included as well as an Ant XML configuration to make the task work.